This is a sure shot hit among kids and grown-ups and at the same time very healthy. Generally it’s made with All-purpose flour, but I remember my mother said once that my grandmother use to make it using Whole wheat flour. I tried that with a few changes as adding banana and Egg (Which is completely optional) and my kid simply loves it. 1. Mix the banana and Jaggery so that the Jaggery is almost dissolved in banana. 3. Let it rest for 5-10 minutes. 4. Heat a non stick pan with and grease it with butter. Pour a spoonful of batter onto the hot tava and spread it to the size and thickness as desired. If the batter is thick it becomes a little difficult to spread it out. In that case just add 1-2 spoons of batter and let it take the shape. 5. Cook it on a slow flame until golden brown from below around 5-6 minutes. Reverse it and cook it on the other side. 6. You can make favourite shapes of animals or any cartoon’s using fruits and chocolate or fruit syrups whichever is available at your home. 7. I have used Banana and Chocolate sauce which I had already. 8. Serve it hot with honey. When I made it the next time, I took off the pan from the gas and then spread the batter, this way it does not stick to the pan. 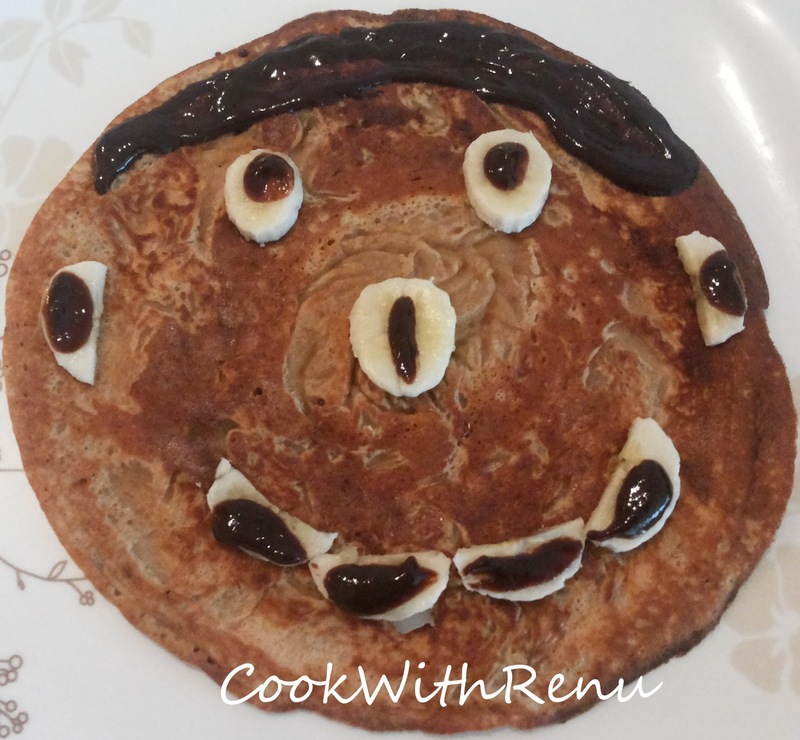 My sons will love these pancakes! Yum! I love pancakes! Love how you can make these vegan too.